One of the criteria of an efficient market is the ability to enter and exit at all points of time. Here, we are not talking about making a gain or loss, but of the liquidity of the market and widespread participation. What the experts otherwise call market timing may not be possible if exit is not easy due to any reason. 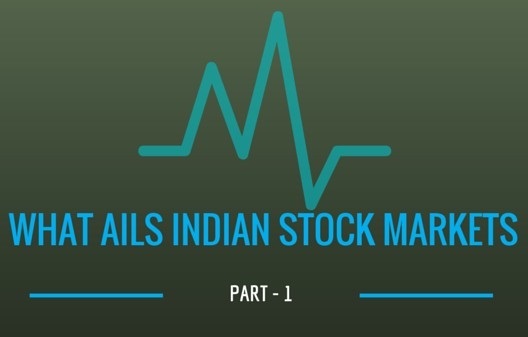 Indian stock markets suffer from what we can call the Abhimanyu syndrome. Small investors are now the cynosure of all eyes. Tomes have been written on how to woo them to the share market. Many industry associations have offered a plethora of ideas on how stock markets could attract small investors, and continue to do so. As a result of this dissemination of awareness about the stock markets, the interest and participation of small investors is expected to grow. The so-called small investors are the children of the Controller of Capital Issues (CCI) raj. Till the early nineties, the CCI used to fix share prices and allow FERA companies to offer stock in the market at those artificially fixed low prices. Investors used to apply for these shares under different names, only to offload them in the market at exorbitant prices after listing. In the process, several fly by night operators also floated companies and took advantage of the boom of the early ’90s. The Harshad Mehta affair was only a part of that story. An important feature of the period was that the stock exchanges took into account only the listing fees while listing companies, and not the due diligence factor and other fundamentals. Later of course, SEBI formulated guidelines governing the listing of new and existing companies in terms of their track record and other parameters. Investors who entered the market during those halcyon days are unfortunately not in a position to exit now, even at a loss. As many of us are aware, in the Mahabharata during the Great War, Abhimanyu, the son of Arjuna, knew how to enter the Chakravyuha. Abhimanyu met his nemesis because of his inability to come out of the Chakravyuha formation made by the Kauravas even though he could enter it. For the benefit of the MTV generation, let me explain by saying that Abhimanyu, the son of Arjuna in Mahabharata, learnt the art of entering the Vyuha when he was in his mother’s womb. But before he could be taught the exit technique, he was born. He could not double-click on a mouse then! Pertaining to both BSE and NSE. Pertains to NSE and average for the year. Based on SEBI/NCAER survey 2000. Includes cash  Derivatives  and currency derivatives . # Based on SEBI-NCAER Survey, July 2011. 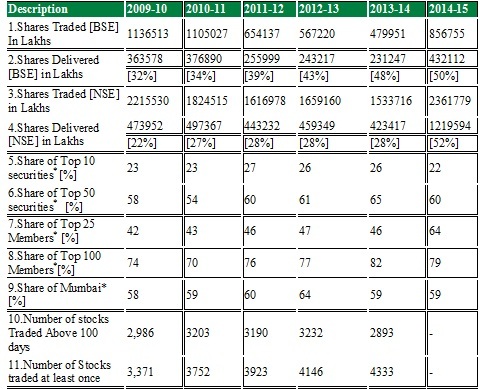 BSE Key Statistics (calculated) and NSE Data Zone for the respective years. The plight of these investors is due to major problem of illiquidity in our markets. The stock markets are very illiquid. This means that there are no takers for most shares at any price. Though nearly 9,000 shares are listed in all our exchanges, nearly half were not quoted or traded last year [see Table 1.2]. Another 25% were quoted only a couple of times during the last year. The shares of only 50 securities commanded more than 60% of the trade turnover. Compare this with the New York Stock Exchange (NYSE), where no single scrip normally enjoys more than 1% of the turnover. 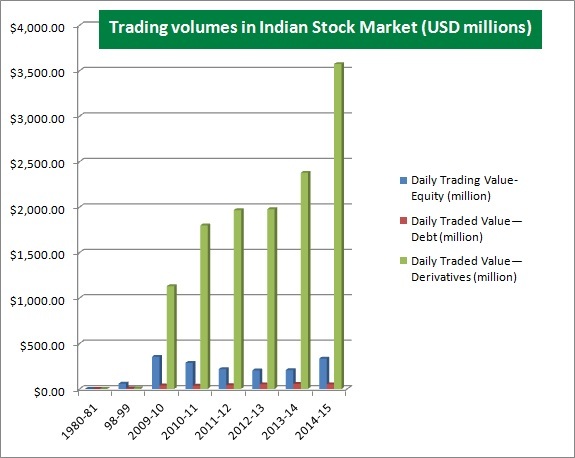 Though market players and exchanges blow their bugle about India having the largest number of scrips listed; only around a hundred scrips are active. Actually, last year, only 4300 scrips out of nearly 9000 shares were traded at least once. [Table-1.2]. So, if you hold the wrong scrip, you can only use it as cattle feed! As we have seen elsewhere [India Uninc—2014 –Westland Publishing] significant portion—as high as 50%- of our GDP is generated by Partnership/proprietorship firms. These are not present in the listed market and also not fully captured in our growth story. The increasing divergence between economic growth and corporate performance is yet another indicator of the fact that share market companies constitute very small portion of our GDP. Pronob Sen the chief Statistician explains the gap between performance of macro economy & corporate sector to lower inflation and higher taxes. But the story is more straight forward. So the stock market is no barometer of the Indian corporate sector, leave alone the Indian economy. Later we see the nature of savings flows which goes into our markets as well as the role of FII and FDI. Source: Rows1 & 2: Table 16& 32, SEBI Bulletin April 2015; Rows 3& 4: Table 17 & 33 SEBI Bulletin April 2014; Rows 5, 6, 7 & 8: Table 31, SEBI Bulletin April 2014; Row 9: Table 24 SEBI Bulletin Sept 2014; Rows 10 & 11: Table 2.24, p 61, SEBI Annual Reports 2013-14.